Research in the Wankel lab at WHOI aims to better understand the biogeochemical feedbacks that control elemental nutrient cycling in marine and coastal environments around the globe. Specifically, we are interested in identifying nutrient sources and cycling mechanisms (with an emphasis on nitrogen cycling) in order to improve our understanding of the controls on ecosystem function. By examining the interface between biotic and abiotic elemental transformations and how the coupling between geochemistry and microbiology affects ecosystem functions in marine environments, we work to enable prediction of the response of ecosystems to impending environmental change (whether natural or anthropogenic). 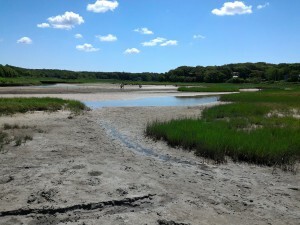 Our work is therefore not rooted in a single type of environment and includes deep-sea projects at hydrothermal vents and hydrocarbon seeps, coastal projects in estuaries, tidal marshes and aquifers and more elemental geobiology projects that use sophisticated lab techniques for answering questions about fundamental interactions between microbiology and geochemistry. Primarily, we are interested in questions concerning the fluxes and origins of nitrogen and carbon in marine/aquatic environments and the major factors (biotic and abiotic) that work to regulate those fluxes. 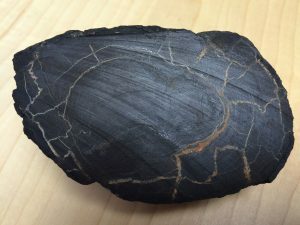 A major aim of our work is to understand interactions of these nitrogen and carbon processes with other elemental cycles, especially iron and manganese. In this direction, we are also calibrating the use of oxygen isotopes in manganese oxides as a means for differentiating (a)biotic oxidation pathways in a range of environments, including Mars. 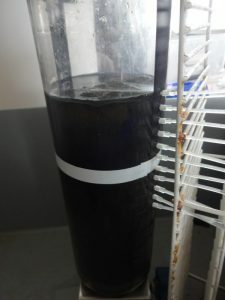 In general our approaches include techniques for measuring natural abundance stable isotopic composition of a range of N and C bearing compounds in lab experiments, field samples and in situ. 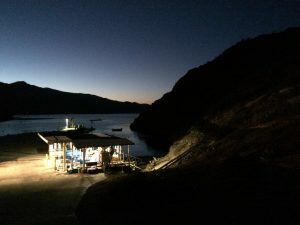 To this end, we are also actively developing new tools that can expand our ability to examine complex biogeochemical processes, including novel isotope approaches and in situ stable analysis in estuaries and even the deep sea by laser spectrometry. Coastal ecosystems – source or sink? Atmospheric levels of nitrous oxide (N2O), one of the most radiatively important greenhouse gases, are steadily increasing. Yet predicting patterns of emission in natural systems remains highly speculative and very difficult. Marine ecosystems comprise a large component of the global N2O atmospheric flux, with coastal zones and estuaries being important contributors to atmospheric N2O. In the face of the widespread environmental change predicted to occur in global coastal ecosystems over the following decades, changes in N2O emissions have significant implications for climate forcing. Nevertheless there exists a wide range of estimates of N2O fluxes to the atmosphere and future projections of N2O production and emission are confounded by extreme spatial and temporal variability of biological sources and sinks (biogeochemical processes). We are working on innovative ways of improving our understanding of the dynamics and interplay of these processes and how they act to regulate N2O flux to (or from) the atmosphere. Central among these approaches are multi-element stable isotopic analyses of N2O and a variety of its precursors – including novel triple oxygen isotope and intra-molecular site preference measurements. Nitrogen (N) is a key component of fundamental biomolecules. Hence, the cycling and availability of N is a central factor governing the extent of ecosystems across the Earth. 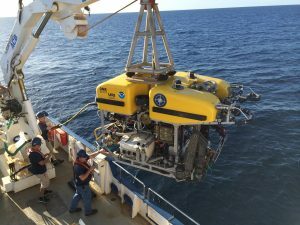 Although hosting the largest habitable environment on the planet, the deep marine biosphere, including those environments below the seafloor in sediments and within the ocean crust, remain poorly understood – in particular with respect to the sources and cycling of nitrogen that sustain these microbial communities. 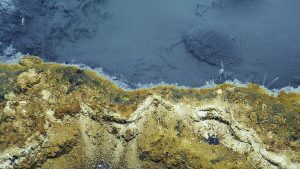 In the ocean crust – warm fluids move quickly through permeable basalt – allowing the delivery of nutrients and electron acceptors and donors necessary for sustaining life. We are collaborating with several groups that are sampling crustal fluids in a variety of contexts (hydrothermal vents, off-axis boreholes, volcanoes etc.) in order to better understand the nature of nitrogen transformations in these under-explored reaches of our planet.